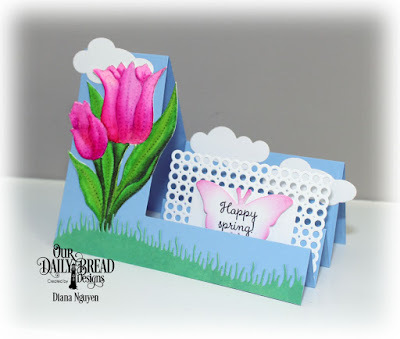 Have you enjoyed the new stamps and dies from Our Daily Bread Designs? I chose to highlight the side step card today. This is a great die that gets the cut and fold just right - no measuring needed! I started with some light blue card stock. I then added some grass and a no-line watercolored Tulip (I also used the coordinating Tulip die to save me on some fussy cutting). To make it more like outside, I added some clouds and some grass. The Circle Scalloped Rectangles was perfect for framing the butterfly shape die cut (from the Trois Papillons die set) of my sentiment Happy Spring from the same Tulip stamp set.